A few months ago I turned 30 and with that I started to become more worried about wrinkles and sagging skin, particularly on my face. Another thing that has always bothered me was oversized pores and broken blood vessels. I’ve been using lotions and wash my face nightly but now I feel like I should do more to prevent and eliminate the signs of aging. I was offered the opportunity to review the Silk’n FaceFX Anti-Aging device. 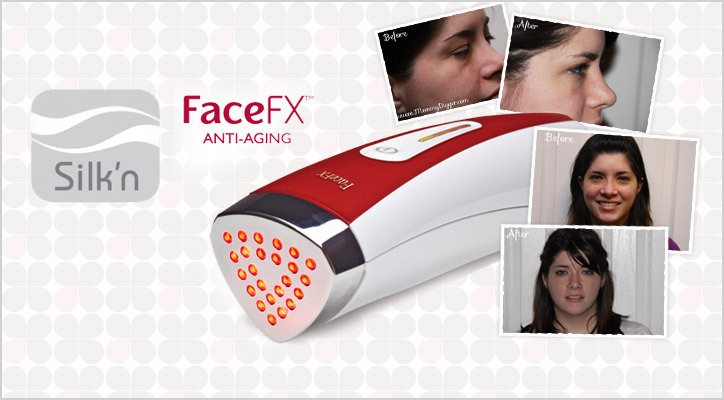 Silk’n FaceFX is a anti-aging device that can be used in the comfort of your home. It uses fractional red light therapy and deep thermal heating that stimulates collagen production to give you long-term radiant skin. Multiple technologies combined into a single system. Synergistic combination of fractional light and healing heat energy to achieve long-term radiant skin. What is Deep Fractional Light? Silk’n FaceFX is a safe and effective way to provide stimulation of heat and light energy to the multiple layers of skin for a total skin solution. You can treat the around the eyes, mouth and cheeks. I’ve been using my Silk’n FaceFX for a little over 2 weeks now and have already seen results! Every other evening I spend about 30 minutes before bedtime for treatment while I watch TV. The device emits a bright red light, heats up so it’s warm to the touch, then I just press it lightly to my skin and move it in each area in a circular motion for 5 minutes. When I am done I just apply some lotion and the treatment session is complete. For the first month of treatment you are supposed to do treatments 3 times a week and after that just once a week to maintain the regime. The major areas of concern for me are the eyes and cheeks. My eyes have the start of wrinkles and I have a tendency to get bags under them as well and ultimately would like to shrink the pores in my cheek area. Plus, I’d just love to have more of a healthy glow! Well, I’m very happy to report that I’ve since using my Silk’n FaceFX for 2 and half weeks I have already seen great results! Where there was once the start of crows feet wrinkles near the outside of my eyes, it has now begun to substantially decrease! My pores have shrunk quite a bit and my skin overall looks healthier and has a more youthful healthy glow. I took a couple of before and after photos just so you can see the difference. Check it out! You can easily see how the wrinkles underneath and at the corner of my eyes has substantially decreased! I’m so thrilled to have this device in my arsenal against aging! Not only does it work and offer amazing results, fast, it is very easy to use and only takes a little bit of time every other night. I seriously love this thing! The Silk’n Face FX is much more cost effective than any Botox treatment or face lift, it costs about the same as just one Botox injection and you get to use it forever! Besides the fact I’m not a fan of needles & would never consider going under the knife. I would highly recommend this to any women who are looking to prevent and reverse the signs of aging. If you’re looking for a device that in comparison to treatments provides a one time low cost, non-invasive regimin you can do in the comfort of your own home, you have just found it ladies! Silk’n FaceFX Anti-Aging and Skin Rejuvenation device is available to purchase at www.silkn.com for $349 and includes one handheld device, charging stand, electrical cord and training manual. Silk’n is giving one lucky winner the Silk’n FaceFX RV $349! To enter fill out the Rafflecopter form here. I received Silk’n FaceFX for the purpose of this honest review. All thoughts and opinions are my own. This post was written by me and not edited by anyone. I absolutely love the FaceFX! After only a few uses my co-workers kept complimenting me and asking what kind of “work” I’d had done to my face. And after two months of use the fine lines around my eyes completely disappeared. My mother is even bought one after I boasted about it and she uses it every night while watching her favorite shows because she loves the soothing warm sensation of the light and the results. Looks like you had great results too! I did, I love FaceFX! It has done a lot for the appearance of my skin and the lines that were starting 🙂 Glad you’ve had such success with yours too! Oh my gosh I love the FaceFX! My best friend got one and swore by it, so I had to try it out for myself. So happy I did – while I’m doing the treatment the warm heat makes me feel so relaxed. I literally feel like I’m sitting on the beach in the sun, except the results are that I have less wrinkles, not more! Great review and thanks for the pictures! I’ve read a lot of reviews on this and most were positive so I thought I’d give it a try and so far I love it! I can definitely see a difference before and after and not only are my wrinkles disappearing but the device also leaves my skin clear and glowing! More than I expected. Love the product. I’ve had my facefx laser product for 6 months now and unfortunately it has done nothing for me. Waste of money. I started using it every night for 15 to 20 minutes after 2 months hoping my wrinkles will start diminishing but no luck. Shall I try something else with it as it is an expensive item just to throw away and which I could hardly have afforded in the first place. ?